The sonic and cinematic strategies of hip-hop producer and rapper T-Pain are the subject of a forthcoming scholarly article by James Gordon Williams, a new faculty member of the College of Arts and Sciences. An assistant professor of African American studies (AAS), Williams is the author of “Crossing Cinematic and Sonic Bar Lines: T-Pain’s ‘Can’t Believe It,'” which will be published in Volume 19 of the University of California, Los Angeles’ Ethnomusicology Review on Wednesday, Nov. 12. Williams’ research and creative practice focuses on “crossing bar lines,” a phrase he coined that defines the study of musical resistance in various genres of black cultural production. Williams, who earned a Ph.D. in integrative studies at the University of California, San Diego, says T-Pain has transformed Auto-Tune into a subversive technology that represents black subjectivity instead of its traditional use as pitch correction software. “I connect sonic analysis to signifiers in the video, which are representations that deploy constructions of race, class, gender and sexuality, as they relate to notions of blackness,” he adds. 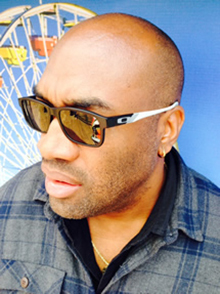 Born and raised in Los Angeles, Williams has lived, studied and performed in various cities, including Boston, New York and most recently, San Diego. An accomplished musician and critical musicologist, he is interested in how music composition and improvisation reflect notions of African diasporic racial identity.